In order to access the online services and log into the campus computers at TAMIU, you are required to set up a Net ID. In order to do this, click here. Please note, that when setting up your Net ID, you will be prompted for your Banner ID and date of birth. Please note, when entering your birth date, you must include the forward slashes in mm/dd/yyyy format. 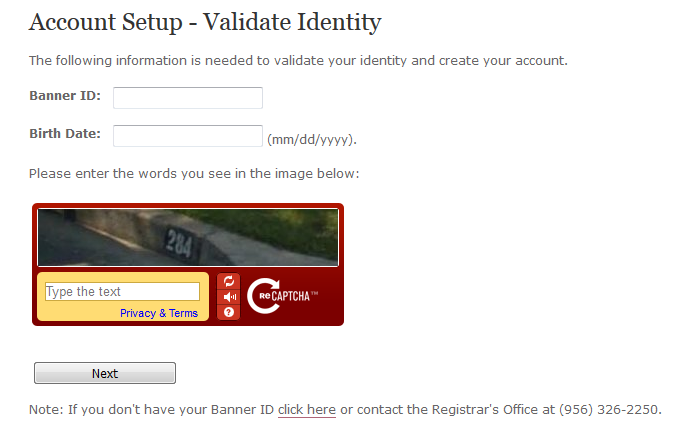 In addition, ensure to fill out the reCAPTCHA. Once you click ‘Next,’ follow the steps in creating your Net ID. For more information on the Banner ID and Net ID, please click here.